UNC Lineberger breast cancer faculty members presented their research findings at the 2016 San Antonio Breast Cancer Symposium Dec. 6-10. The meeting drew more than 7,000 cancer caregivers and scientists from around the world, who attended talks and presentations on the latest developments in breast cancer care and research. Susan G. Komen announced UNC Lineberger researcher Charles M. Perou, PhD, as the recipient of this year’s Brinker Award for Scientific Distinction in Basic Science. 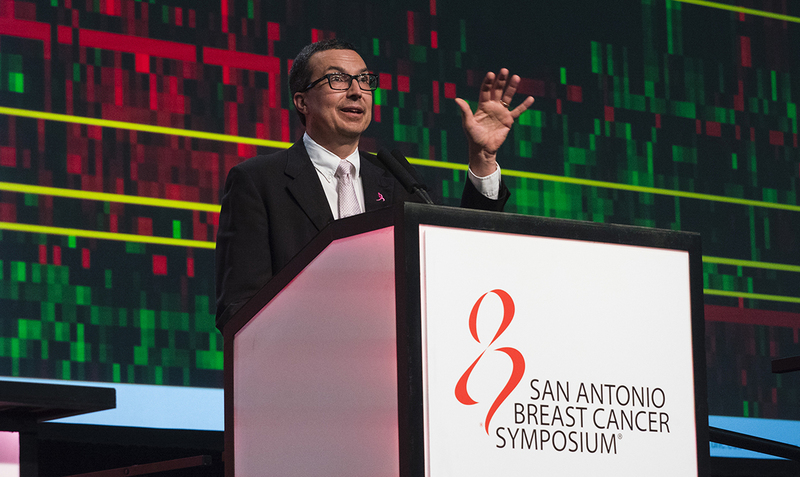 UNC Lineberger Comprehensive Cancer Center researchers and physicians shared research findings and gained recognition at the symposium, which draws thousands of breast cancer physicians and researchers to San Antonio. Other UNC Lineberger members also presented research findings at the largest breast cancer research meeting in the United States. Maki Tanioka, MD, PhD, shared findings from a preliminary study that identified biomarkers that the researchers believe may help predict how patients with HER2-positive operative breast cancer will respond to trastuzumab (Herceptin) and chemotherapy. The American Association for Cancer Research, one of the meeting’s sponsors, presented Tanioka with an AACR Scholar-in-Training Award. Katherine Hoadley, PhD, reported she and her colleagues developed a model that can predict which triple negative breast cancer patients will respond to chemotherapy. UNC Lineberger researchers and collaborators led by Shlomit Shachar, MD, and Carey Anders, MD, investigated the incidence of brain metastasis in the period after a series of drugs were approved to treat HER2-positive metastatic breast cancer, starting with trastuzumab, also known as Herceptin, in the United States in 1998. Trevor Jolly, MBBS, and Carey Anders, MD, presented outcomes for an analysis that found that women who are 65 years or older with metastatic breast cancer were more likely to have a cancer-linked genetic alterations in their tumors, and had a larger total number of genetic alterations, than younger patients overall. An analysis led by Katie Reeder-Hayes, MD, MBA, a UNC Lineberger member and assistant professor in the UNC School of Medicine, compared toxicity and effectiveness of traxtuzumab combined with anthracycline versus platinum chemotherapy for adjuvant therapy of HER2-positive breast cancer in older women. Melissa Troester, PhD, a UNC Lineberger member and associate professor in the UNC Gillings School of Global Public Health, was first author of a study presented at the symposium that examined differences in subtype by race and age for women included in the third phase of the Carolina Breast Cancer Study.